The following perceptive comment was sent by email to SOTN. It simply states the obvious about the Central Intelligence Agency and its complete control of the United States of America, and beyond. It also shows just how extensive Deep State really is. Every publicly traded corporation, for example, within the Anglo-American Axis is controlled, either directly or indirectly, by the C.I.A. That’s why the U.S. Intelligence Community refers to it as The Company. The Global Control Matrix (GCM) is actually the backbone of the New World Order, and functions as a de facto One World Government. Deep State is just one critical piece of the GCM puzzle. Just because the current World Shadow Government operates in total secrecy doesn’t mean it doesn’t exist. The globalist New World Order (NWO) has actually been here for well over a hundred years in its current form. The NWO agenda has been painstakingly implemented by the very same powers groups* that engineered World War I, the Great Depression, World War III and the current War on Terror (aka the cold phase of World War III). The bottom line is that the C.I.A. is primarily the enforcement agency for the WSG. It was recently written that the C.I.A. is the “enforcement agency for the Council on Foreign Relations”. And that’s entirely true. However, the C.I.A. is also the enforcement agency for every other entity within Deep State, both public and private, covert and overt. JFK Assassination Plot Was Coordinated and Conducted by the C.I.A. And all the C.I.A. ever has to do to justify their never-ending criminal conspiracies is claim that they are being implemented in the interest of “N A T I O N A L S E C U R I T Y”. As if publicly executing a POTUS was carried out to make the nation more safe and secure. N.B. What is remarkable is that the post below only represents the tip of the CIA-controlled Deep State iceberg. It also illustrates why The U.S. Central Intelligence Agency Must Be Shut Down before it shuts US down. 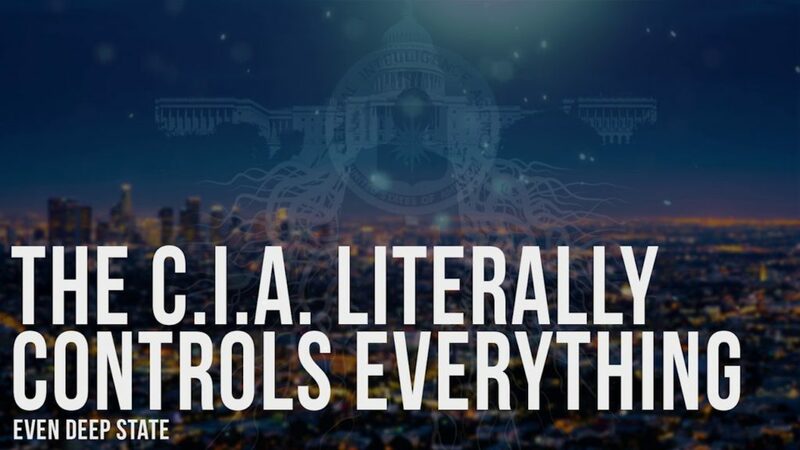 What Does the CIA Control? The Mainstream Media is CIA (all TV, Radio, Newspapers & News Magazines). Hollywood is CIA (all Motion Pictures and TV programs). Hewlett Packard is CIA…..the list here is endless, let’s just say all of Silicon Valley is CIA! The Bin Laden Family is CIA. Noriega was CIA, who went rogue on the CIA. Castro was CIA, who went rogue on the CIA. Soros is CIA & MI6. Clinton Crime Family is CIA, especially the Clinton Foundation. The White House has been CIA for over 25 years. The FBI is CIA. (obviously, or else the FBI would have shut down the Mafia years ago. But they don’t do they? Because the CIA and the Mafia are joined at the hip. They are partners in crime as the JFK assassination clearly demonstrated. The Las Vegas Massacre was CIA. Northern California UNnatural Fires were CIA. Oklahoma City Bombing was CIA. Aurora Movie Theater Massacre was CIA. Sandy Hook was CIA……this list too is endless. Agenda 21 Depopulation Goals are CIA. When I say CIA, I mean CIA/Deep State controlled. Insiders call the CIA “The Company”. That makes sense now, doesn’t it? 6 Million people work for the CIA. CIA/MI6 have their tentacles into EVERYTHING of value, GLOBALLY. SERCO is CIA … and MI6 … and Mossad. The CIA sets the AGENDA and Controls the Narrative. Big Brother is CIA. They are everywhere: in your phone, on your PC, in your TV, in your car, in your fridge, your smart meters, and in all surveillance cameras and spying devices which are now everywhere. Even if these items are turned off, and you don’t pay the bill and shut down services, they can still turn it on whenever they want to and listen and watch you. Agenda 21, Big Brother (CIA) wants you dead, either through deadly vaccines that infects you with cancer and then cancer treatments that don’t work. Agenda 21/Big Brother/Deep State/ CIA wants to decrease the global population through disease, wars, pestilence, famine, weather modification (droughts and deluges, mudslides and floods, earthquakes and volcanoes, massive hurricanes, ice storms, blizzards, tsunamis, sink holes, you name it). And, of course, through the promotion of rampant homosexuality (homos can’t reproduce). Christian Western Civilization is being destroyed on purpose by importing Islam which never assimilates and only brings division and civil wars. Just ask Gandhi. It got so bad in India, they had to divide their land, and all Hindus and Christians staying in India, and the Muslims went to Pakistan…….because militant Islam (Wahhabis) NEVER lives peacefully with anyone else. So you have to ask, why is the CIA/Deep State flooding the USA with Muslims? To promote Peace? No, to promote DIVISION and CONFLICT. These are just some of the TRUTHS the CIA/Deep State does NOT want you to know about, and that is why they HAVE TO CONTROL all media: TV, radio, newsprint, and now they are going after the Internet with censorship. You are supposed to remain in the dark, dumbed down, and swallow hook, line and sinker whatever Big Brother CIA spoon feeds you from TV, radio, newsprint….and the Internet. Everything else if “fake news”, remember? What has upset the status quo is a groundswell of truth getting out via the Internet and Alternative Radio, YouTube and Instagram. A tipping point was reached last year, and in spite of MASSIVE Vote Rigging on all levels, Trump still WON!. Trump is NOT CIA, thus the nonstop smears from Mainstream Media!